The South African mining industry is no stranger to uncertainties, from questionable pieces of legislation to a fluctuating economy and weak rand. Added to this is the pressure of high wage bills, which is often worsened by inflated working hours, ghost employees and theft of product and materials. Active Track offers some certainty with its GSM-enabled FPX10 device, which was demonstrated by the deployment of an FPX10 to an open-cast mine in the Northern Cape. The mine was conducting prospecting operations in respect of certain iron ore deposits. The holders of the prospecting right sat in Gauteng, and relied solely on managers to see that the work was being done. However, over time the prospecting operations slowed down and staff were failing to meet the works timeline. This resulted in the holders calling on Active Track to deploy a free demonstration unit to determine whether it could improve productivity in any way. The following day, the sales representative for the Northern Cape met management on site, and trained them on the FPX10 and its web-based support platform. Thereafter, fingerprints of all staff were loaded on to the device and site-specific parameters were set. For a period of 30 days, each staff member scanned his/or her fingerprint as he/or she arrived on the mine and left at the end of the day. In this way, the time and attendance of all employees was logged. The data was effortlessly integrated into the mine’s payroll management system – the integration ensures that staff are only paid for the real hours worked. This exercise resulted in a reduction of the mine’s payroll, with the added benefit of there being no dispute regarding the reason for the various pay reductions. In addition to a reduction in payroll, the business was able to monitor time and attendance remotely, via the online support platform. In real-time, management could log on to the portal and see which employees had reported for duty and/or failed to do so, and which staff members had arrived late or left early on any day. Daily reports were automatically generated from the captured data, and could be accessed via the portal. This tool equipped the business to take disciplinary action against under-performing staff. The FPX10 was configured so that management would receive automated email and SMS notifications in the event of breach of the mine’s pre-set parameters, or activation of the FPX10‘s panic or emergency functions. The FPX10’s extended battery life, portable design and rugged casing ensured that the unit was always operational and not affected by general dirt or dust in any way. While the scale of the prospecting operations did not require it, larger mines can also utilise the FPX10 to control access to various areas such as mining machinery and equipment storage facilities, refuelling areas, mineral storage facilities, workshops, and offices by granting certain personnel access to specified areas. 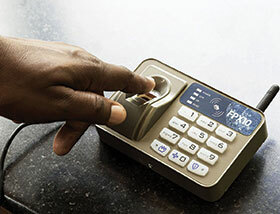 Electronic locks offer hotels far more than simply a more convenient way to manage doors, they can be integrated into a host of other systems and services. Using the right solution to protect large, open areas can be accomplished with the right technology and planning. ZKTeco recently expanded its reach in the facial recognition market with the launch of its new series of visible light facial recognition (VLFR) products. LH7500 hotel door locks are the latest models from ZKTeco’s Smart Lock series with elegant designs and support for Mifare cards and the EU standard mortise. The LH7000 hotel door lock is the latest from the ZKTeco Smart lock series, supporting Mifare cards and the EU standard mortise. Alastair McPhail has taken the position of national marketing manager at time and attendance manufacturers, Jarrison Systems. The new TruSeal product extension is produced from a special biodegradable material sourced from Malaysia. BioStar 2 Mobile Card offers convenience to end-users by storing biometric information, to function as a credential, in their own smartphones. A report from Trend Micro reveals the potential cyber threats facing RF controllers and what industry needs to do to limit their risk. Visible light facial recognition technology has been developed for purposes where high-speed facial recognition at an extremely high level of accuracy is vital. Modern retail cash management has evolved so far from the old ‘dumb’ safe that it has become an essential enabler of today’s business. Think someone hacking your access control system not a big deal? Scott Lindley suggests that you think again.